The 2015 Tigers officially ended their campaign on Sunday. The season was over long ago, but it didn’t go in the books until around 6pm last night. It’s over and done. They can’t hurt you anymore. For the first time since 2010, the Tigers don’t have any games after #162 so we can get to work early on planning for next season. There is plenty up in the air and plenty that will be decided based on the actions of the other 29 teams, 10 of whom are still focusing on 2015. For our sake, let’s spend this post looking internally. 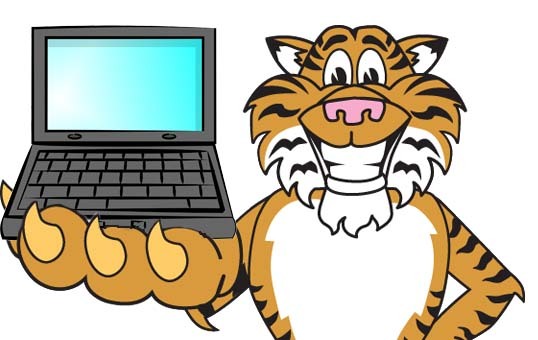 Who are the current Tigers who will serve on the 2016 roster and what will their roles be? These guys will make the MLB roster unless they are hurt or traded, it’s just a question of how they’re used. These guys will be contributors in some form or fashion, but have less job security than those above. There are certainly other players in the organization who have and will see MLB time in 2016. The relief corps, Bryan Holaday, Dixon Machado, and Steven Moya, in particular. Expect to see Michael Fulmer as well. So how does this shake out? Where does that leave the 2016 Tigers before making offseason moves? Here’s my general expectation. This isn’t exactly what I would do if I was in charge or exactly how I think the roster will look, but it’s a general guide based on both. I expect McCann has established himself to the point where the club won’t look for a primary catcher during the offseason. Cabrera, Kinsler, JD, and Victor are safe, with the possibility that JD might wind up in left. Verlander and Sanchez have rotation spots if healthy. Iglesias will play short, but I hesitate only because it is possible they wind up trading him to fill a need elsewhere given Dixon Machado’s defensive ability. Nick Castellanos probably isn’t as good as the team wants him to be, but his offense in the second half is enough for me to think the team won’t move on this offseason. Norris has probably locked up a spot in the rotation, and I expect either Boyd or Fulmer will win another. The bullpen will be a big question mark, but Wilson and Hardy have done enough. As for the bench, a lot depends on how the starting spots shake out, but Romine and Collins seem like safe bets for two of those spots. This is a long list, but there are only two or three critical needs. The Tigers absolutely need a top tier starter. Maybe not Price or Greinke, but they need a very good starting pitcher. Someone who can be in the 4-6 WAR range. They also need one of their new outfielders to be a top tier player. Cespedes would fit, but so would Heyward or Gordon. Or someone on the trading block come December. They will also need another outfielder, and even if they want to give Gose another shot, having no real alternative is a bad idea. Gose is likely a backup at the MLB level and the Tigers shouldn’t plan to have the job be his to lose. They need a catcher and some bench stuff, but those are easily attainable. The key is actually caring about the spots, which Dombrowski often didn’t. Finally, the bullpen. We’ll see what Avila’s philosophy is, but Dombrowski would famously sign one Proven Closer and then magically assume all of the in house options would hit their best possible outcomes. How many times can you really believe Alburquerque is going to be a shut down reliever? 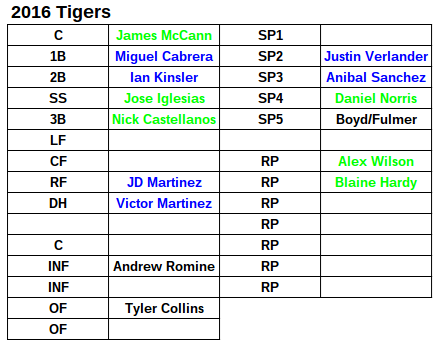 The Tigers realistically, and I’m not kidding, need to sign about six legitimate relievers this winter. One or two should be very good. So that’s it. Really good outfielder and pitcher, decent outfielder, bench help, and relievers. It’s a long list but a doable one if they are trying to contend in 2016. I’ll have follow up posts advocating for particular targets, but now we have a sense what they need to find once the hot stove heats up.